When spring finally rolls around and the snow on the ground begins to melt, I know it’s time to make my visits with our farmers. I always find these visits to be very educational and exciting. Even though there is nothing growing yet, my objective is to make sure our farmers understand what we are looking for in the coming year. This year, my first stop was to Dawson Orchards (http://www.dawsonsorchards.com/), in Enon Valley, PA. When I got to the orchard, I was greeted by the owner, Carolyn McQuiston, who was ready to show me around. Carolyn’s apples can be found on our salad bar from October to May throughout our restaurants in Western PA, Ohio, and West Virginia. We started the tour at the packing house, where she showed me how the apples were washed and then packed into either bags for retail or boxes for foodservice. She informed me that apples harvested in September and October are placed in Controlled atmosphere storage (CA) until they are ready to be shipped. From the top: Apples being cleaned, packing the apples, cold storage, me in the orchard. Controlled atmosphere storage is a method in which oxygen levels, temperature and humidity are kept constant. The exact conditions in these rooms are set according to the apple variety to achieve the best quality. CA storage is used by all apple growers, regardless if they are from Pennsylvania, New York or Washington. So remember: the apple you eat in April was most likely harvested in September or October from the previous year. After we left the pack house, she toured me through the orchards, and before I left she invited me inside for the best apple dumpling I’ve ever had. Unfortunately, I couldn’t talk her into sharing the recipe with me, so I convinced Regis, our head of menu development, to share an apple recipe that you’ll be seeing in Eat’n Park in September: Waldorf Salad. Scroll to the bottom of my post to get it. 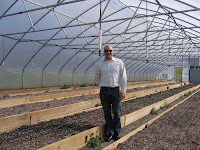 A few weeks after my visit with Dawson’s, I was off to meet with a few of our farmers in Western PA: Art King from Harvest Valley Farms (http://www.harvestvalleyfarms.com/) and Don Brenckle from Brenckle’s Farm and Greenhouses (http://www.brenckle.com/). We have been working with these two farmers for the past 5 years, so they know the drill and always look for us to try to execute something new. Both of these farmers grow tomatoes, squash, cucumbers, peppers, beets and corn. In the coming months, look for these items to be incorporated within our menu and salad bar. The tour wouldn’t be complete without visiting my good friend of about 7 years, Steve Groff. Steve’s farm, Cedar Meadow Farm (http://www.cedarmeadowfarm.com/), is located in Holtwood, PA. Cedar Meadow Farm grows tomatoes for our Eastern PA restaurants. Steve’s farm is a little unique because he doesn’t till his land; in fact, some of his land has not been turned in over 30 years. Steve has pioneered the "Permanent Cover Cropping System", which includes no-tillage, cover crops, and effective crop rotations as a way to increase profits, enhance soil and water quality, and reduce pesticides. The cornerstone of this system is a unique emphasis on maintaining a permanent cover of crop residues and cover crops on the soil surface and having something living in the soil at all times. All vegetables and crops are then seeded or transplanted into the organic mulch. This permanent cover aids in weed control, has virtually eliminated soil erosion and has increased soil and water quality. As I looked at the barely thawed out land, I noticed many large radishes that were decomposing on the top of the soil. Steve told me they were called Tillage Radishes. These radishes are planted late in the growing season and are used to aerate the soil and bring nitrogen (an essential element for growing vegetables) to the surface. Basically, the roots of the radish grow deep into the soil and when the ground freezes, these radishes pop out of the soil from the pressure of the frozen ground. When this happens, the radish leaves a hole in the ground (providing aeration) and the root on the surface of the soil provides the nitrogen for the next crop that will be planted. 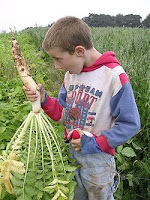 To learn more about Tillage Radishes, check out http://www.tillageradish.com/. We are so proud to work with these growers and hope that you take the opportunity to stop in and check out the local products we feature at your neighborhood Eat’n Park. Place apples in a mixing bowl and squeeze lemon juice over them. Toss to coat. Cover and refrigerate at least 1 hour prior to serving. Ever heard of a "Big Girl" Burger? Fond memories of Grandpap and "Park and Eat"